With a large photo collection and a small staff, we have many images that don’t often see the light of day. We have a William Smith College volunteer organizing our oversize photo collection. They are too large for a flatbed scanner or to be placed in binders so they are often overlooked. I randomly selected six images to research for this month’s blog. While many newspapers have been digitized and are online, the search engines can still be frustrating. Even with group and individual names and dates, information can’t be found in the newspapers. I’m left wondering if the groups and events were not reported or if I have been asking the wrong questions of the Internet. This is a Castle Street scene from the early 1900s. A local group raised money for and constructed a playground. 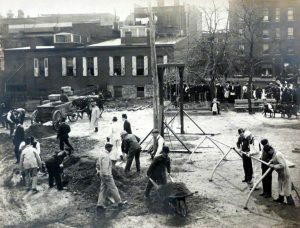 The men are working on the site of today’s City Hall (1913) while the watching crowd is near the present post office (1906). Linden Street and its buildings are visible in the background. Like many turn-of-the-20th-century photos, this was mounted on cardboard. Names were written around it with the inscription “The Dolphin Club 1896-1897.” It was signed by local photographer James Hale. I feel strongly that this was a Hobart College club but newspaper searches of the college and Geneva papers turned up nothing. Even though I found little about this image I love it just the same. Slicked down and parted hair, pince-nez glasses, high stiff collars, and high-top leather shoes. It was probably uncomfortable but it was definitely elegant. This was the Geneva Club in 1919, “supper and business every Tuesday night 25 cents 6:15 p.m. at YMCA.” There was another Geneva Club photograph – an arranged oval of individual head shots – that appeared to be late 1800s. 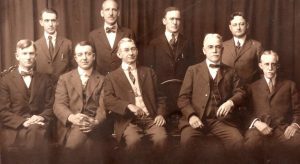 The 1922 city directory shows Dr. Albert Heist (seated, second from right, with glasses and moustache) as chair of the YMCA executive council. The flag before them has a number of stars, it looks like a large version of a service star flag. I wonder if it was in honor of former members who fell in World War I. 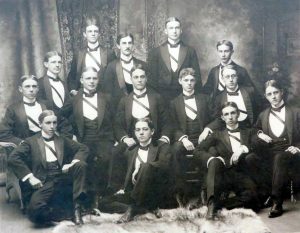 This photo was labeled, “Champion Football Team of Ontario County, picture taken Thanksgiving 1894.” Although there were no identifying jerseys the photo did have names and I learned this was the 1894 Geneva High School team. 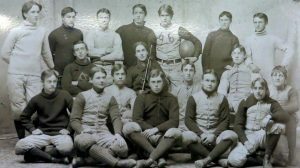 This was one year before the first forward pass was thrown, and the same year that southern powerhouses Auburn, Alabama, Georgia, Clemson and others formed their first football conference. 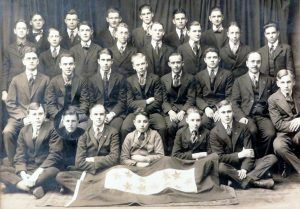 The donor of this image labeled it “1934 Easter Tournament Senior A ‘Nighthawks’” but did not write down players’ names. 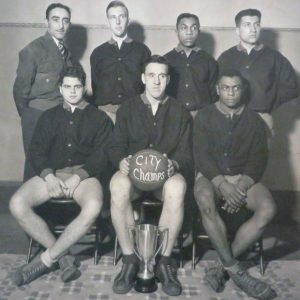 Ebo Alberts, standing at far right, is a recognizable figure in Geneva sports from the 1930s through the 1950s. Beginning in high school, he played football, basketball, and lacrosse and continued well into adulthood. African Americans aren’t well represented in our photos. The first half of the 1900s was a low point for Geneva’s black population, which increased after World War II. High school yearbooks and sports teams show the folks that were here. We are always looking for more photos, donated or loaned, that document Geneva’s diversity. This was a group of Geneva dentists around 1915, based upon their names appearing in the city directory. A few gentlemen look like they may have practiced for quite awhile. All Geneva dentists (there were several more not included in this photograph) had their offices downtown and all but two were on Seneca Street. I often explain that the upper floors of downtown buildings were once all offices and medical practices. With the exception of the playground and basketball photos, we have the names of the individuals shown. I refrained from listing them all but if you are interested or think you recognize a relative, please contact me and I will be happy to provide them. My great grandfather’s sister was married to Asa Smith. I believe he was a dentist and at one time had an office in Northville, Cayuga County in the later 1800’s. He wasn’t, by any chance, pictured in your photo of the area dentists, was he? Thank you!